The families of some Welsh servicemen killed during the Iraq and Afghanistan conflicts have laid wreaths at a new memorial to them outside the Ministry of Defence in London. 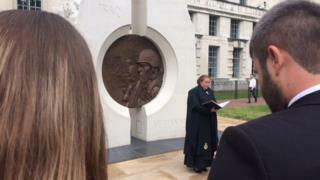 The names of those killed in 12 years of fighting were read out in front of the £1m monument. The relatives were among those who had not been invited to the original opening ceremony in March. It was described as a "wonderful tribute" to those who died. Army Chaplain, Reverend Amy Walters, told them: "You need no reminder, no name inscribed on a wall, no monument - you will never forget. "The Army, though, and the nation have to remind themselves because the world moves on." Many families were not invited to the official unveiling in March but the Ministry of Defence (MoD) said "to ensure each group is represented, charities and groups representing the bereaved were asked to suggest attendees". The Royal Welsh Regiment organised this trip so relatives could have their own more intimate service. The regiment, and before it, The Royal Regiment of Wales and The Royal Welsh Fusiliers, lost 13 men in the conflicts. Pte Craig Barber, from Ogmore Vale in Bridgend county, was killed driving a Warrior armoured vehicle in Iraq in 2007. His grandfather Lance Barber said: "It's a wonderful tribute, really brilliant." However, Pte Barber's grandmother Marion added: "But it doesn't get any easier." L/Cpl Ryan Francis, from Llanelli, Carmarthenshire, died in Afghanistan after his Warrior armoured vehicle was blown up by an improvised explosive 10 years ago, almost to the day. His father Gwyn said the service brought it all back: "Lovely memorial, but it's hard going," he told me. His other son Gregg thanked the regiment for laying on the event, but added: "It would have been nice to have been invited to the event in March." In 2009, Pte James Prosser from Cwmbran, Torfaen, died. He too was in a Warrior vehicle and it was an explosion that killed him in Afghanistan. His mother Sarah Adams has since become an accomplished campaigner for the rights of soldiers and bereaved families. Thanks to her, many regiments have improved the way they deal with families at the time of a soldier's death and through the grieving process. For example, casualty notification officers and visiting officers now have to be better trained and appointed more on merit than rank. But on the journey to the London service, she told me there was still a lot of work to be done. "All regiments should have someone in place dealing with bereaved families long after the event," she argued. "It's too big a task for the MoD to look after them, to remember to invite them to all the events. "The Royal Welsh is really good. It now sends out cards on Remembrance Sunday and on the anniversaries of soldiers' deaths to all the families, and makes sure they are all informed of events coming up. "But not all regiments are as good as that." I will not forget watching this mother endure the ordeal of her son James's inquest in Newport a year after his death. And I watched today as she held back the tears when her son's name was read out in front of the memorial. "It's a reality check, to think James is part of a memorial. It's not what you want for them, is it?" she remarked. "I wanted so much more for him than to be part of Afghanistan and that legacy."